fuelled by propane or butane gas. The Heatsource range is designed for a variety of automotive and marine applications as a source of heat totally independent of the engine. reaches the selected temperature. The thermostat is an easy to fit surface mount design and integrates with the new electronics fitted to the HS2000 and HS2800 heaters. An easy to operate panel mounted digital timer/thermostat specifically designed for heatsource, is also available. Unlike some heaters, there is minimal electric current consumption during ignition so cycling the heatsource on and off does not have the effect of additional battery drain. high quality motor/fan combination and innovative current reducing electronics, both of which have been improved in the latest versions, means that even the larger HS2800 draws less than 2 amps during normal operation. Both the HS2000 and HS2800 are supplied with complete fitting kits to suit either vehicle or marine applications. 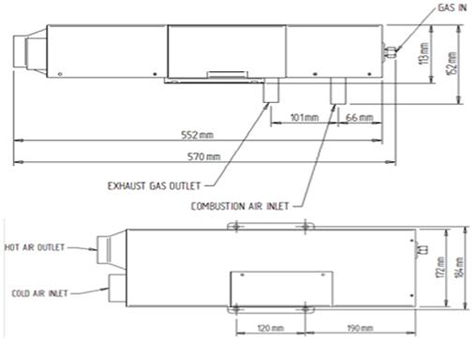 In vehicles and caravans the unit is usually mounted in a bed-box or cupboard, flue downwards through the floor and out to the side of the vehicle using flexible stainless ducting. These ducts (22mm i.d. for the HS2000 and 26mm i.d. for the HS2800) are supplied as standard in lengths of 750mm for vehicles and 1 metre for boats. The ends are finished with neat stainless steel end-caps which comply with EN624. 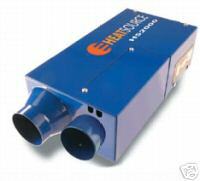 The heat is ducted to one or more outlets through tough highly flexible 60mm or 76mm ducting. In the case of multi-outlet installations, the first outlet is an open outlet with directional control and the rest are closable and are used in conjunction with the appropriate sized plastic Y branches. Marine applications feature an attractive polished stainless steel through hull fitting which accepts the stainless steel pipes for the flue outlet and the combustion air inlet. Extra ducting and stainless steel bulkhead mounting brackets are also part of the marine fitting kits. The chart below reflects the consumption of gas if the heater was running continuously. In reality, both heaters have similar very high efficiency ratings, so the overall gas consumption will be about the same because the HS2800 will be running for a shorter period of time before the thermostat switches it off. 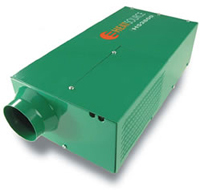 The HS2000E heater is an automatic thermostatically controlled blown air heating system fuelled by propane/butane gas or 230V mains electric. With forced air combustion and the Propex two stage stainless steel heat-exchanger, the HS2000E is a clean and highly efficient way to heat your vehicle or boat. Air for combustion is taken from outside your caravan or boat and passed into the combustion chamber having been mixed with gas during three aeration stages, it is ignited automatically and heats up the large surface area of the heat-exchanger. The Heatsource units are totally room sealed and exhaust all products of combustion externally through the neat 22mm i.d. stainless steels flue pipe. To add to the efficiency, cabin air is normally re-circulated in preference to using cold air from outside. The HS series heaters are also very efficient on 12 volt electrical current consumption drawing less than 1.7 amps on gas operation or 2.2 amps during mains electric operation. For consumption details please refer to the HS2000 above. Developed over 35 years ago, the Truma S Series of caravan heater is today installed as standard by the majority of caravan manufacturers, and because it is so energy efficient and incredibly easy to fit, it is the number one retrofit choice too! There's a solution for most sizes of caravan, and the extremely efficient Ultraheat which offers a welcome boost to your heating system in extreme weather conditions. Within the S Series Heating range, choose between the Trumatic S3002, with 3,400 W of heating power, suitable for most medium-sized caravans, and the Trumatic S5002, with a massive 5,500 W od heating power make it the perfect choice for large caravans, motorhomes and mobile homes. 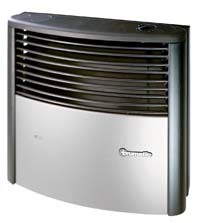 Perfect for use in caravans, the S3002 Heater range is fitted to virtually all caravans. All leading manufacturers in the UK and throughout Europe have supported and fitted this very popular product for over 5 decades. Also available as a retro-fitted product, the S3002 has a range of options and accessories available with it, for example, the Ultraheat and TEB 2 Fan. Predomintaly a very highly efficient but low gas consuming fire, the S3002 is today commonly used with an Ultraheat electrical element as so many campsites now come with electrical hook up. To best suit your caravan, the S3002 has a variety of different front cases to choose from and its modern curved design contributes to the homely feel of your pride and joy. This includes a flame effect option to give a wood burning look and sound effect. You will need to purchase a Heater, a case and a flue kit.